NX CAM from Siemens delivers a complete and proven solution for machine tool programming that enables companies to maximize the throughput of their most advanced machine tools. Siemens, makers of NX CAM Express, have created an in-depth, highly flexible system that allows users to maximize the value of their investments in the latest, most efficient, and most capable machine tools. The best know-how of machine manufacturer makes it possible to offer advanced automatic processing features. Parts data created in CAM menu is a common data used for both Hand-Nesting and Auto-Nesting menu. All users can produce high-quality NC program without the need of any programming knowledge. Mastercam offers a level of flexibility that allows the integration of 3rd party applications, called c-hooks, to address unique machine or process specific scenarios. Mold-Tek offers Prototype and Manufacturing support with professional and contract manufacturing services for requirements like certification and functionality testing and other requirements. Load the layers, modify them and classify them correctly. Means choose class and subclass for each layer by choosing "Modify" from the "Layers menu" in the "Job Editor". 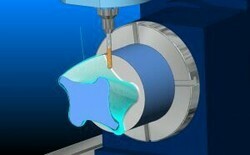 The WOL-CERAM® CAD/CAM system can also fabricate custom implant abutments and custom copings. 1. Running user – defined checks on gerber files . 2. Modifying gerber files as per manufactures rules . Where in a small PCB is put several times on a large panel so that full panel is used & the customer gets more PCB pieces per panel. CAD and CAM single window integrated software. The latest generation CAM software from Pathtrace, EdgeCAM 10, provides full machine simulation capability, extending the already comprehensive verification and visualisation tools. Complete machine tools may be accurately modelled and their movement shown throughout the machining process. thinkCADD’s Edgecam is a market leading computer aided manufacturing (CAM) system. Capable of programming milling, turning and mill-turn machines, Edgecam combines unrivaled ease of use and sophisticated tool path generation. Edgecam is a principal brand of the Planit group - recently ranked by CIMdata as the world's fastest growing CAM vendor, with most industrial users.